Two non-visual components for trapping key press/release and mouse clicks and position change anywhere they happen. It means not only in your application but systemwide. When user presses/releases any key or mouse button or mouse position is changed appropriate event is triggered and key scancode, key name and button identifier is provided. Cursor coordinates are provided for mouse events as well. Source device of event is distinguished by its handle and reported in result set. The cost of a site license is currently 35 EUR. This license permits development using MiTeC Key and Mouse Logger by any number of persons at your place of work. You are granted a non-exclusive, royalty-free right to reproduce and redistribute executable files created using the Software (the "Executable Code") in conjunction with software products that you develop and/or market (the "Applications"). The registered version with source code allows the user to produce any changes in the source code for personal use without agreement with the author. 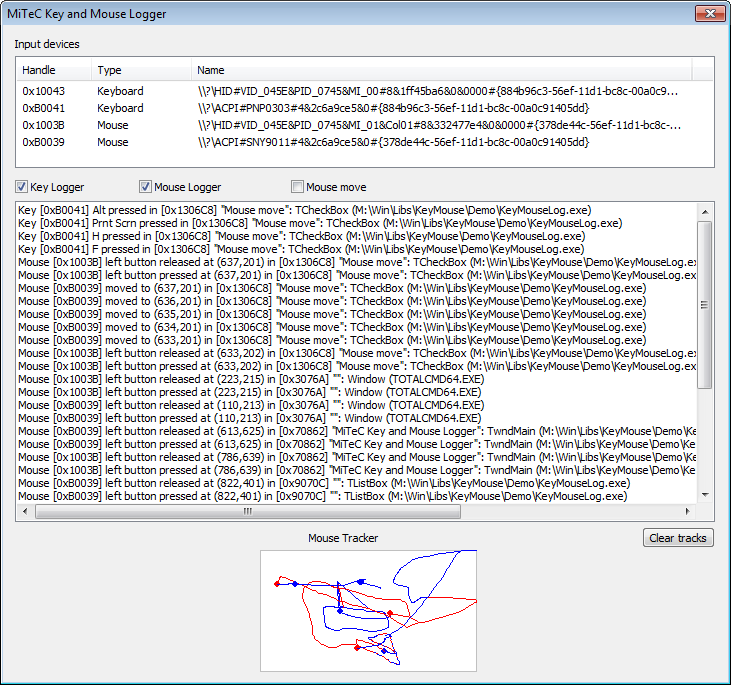 After registering you will get any further version of MiTeC Key and Mouse Logger with sources for free.